Explanation: Known for its spectacular images of Jupiter's moons, Io, Ganymede, Callisto, and Europa, the robot spacecraft Galileo has also aggressively explored the Jovian atmosphere. In December of 1995, Galileo's atmospheric probe descended into Jupiter's clouds and reported a surprising absence of water. It is now believed that the probe entered through one of Jupiter's dry spots, similar to the dark region in this image of the swirling Jovian cloud deck. The smallest features visible here are tens of miles in size. These dry regions appear to correspond to locations where winds converge creating downdrafts. 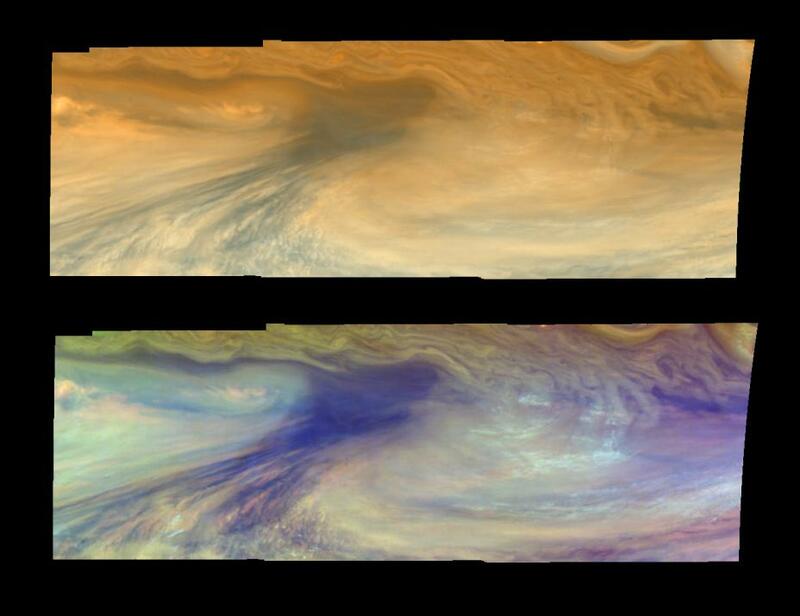 The downdrafts generate local cloudless clearings through which Jupiter's deeper warmer layers can be glimpsed. Just as the dark areas are extremely dry, the surroundings are full of moisture. The contrast is analogous to the desert and tropics of Earth.